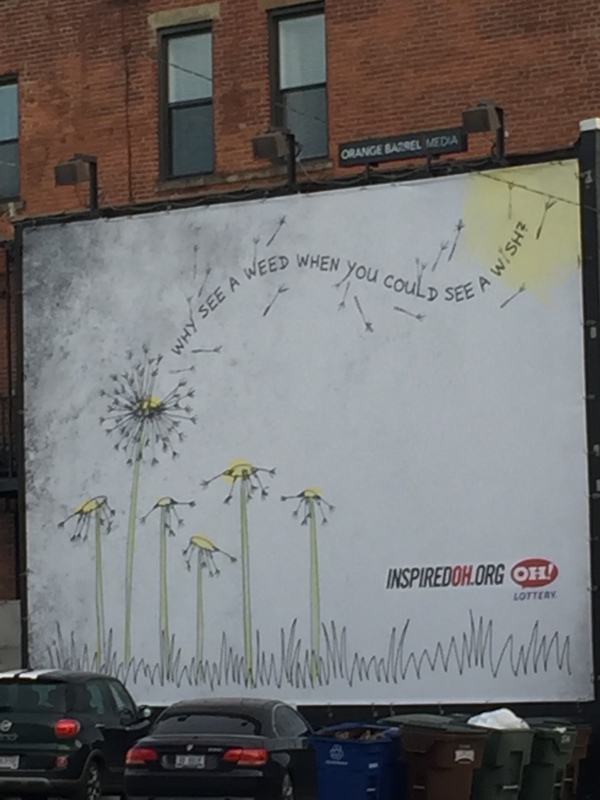 After a quick visit to Michigan to see the Cranbrook senior art show and spend a day with Russell, I’ve concluded — based solely on billboards — that Detroit has a new growth industry. It’s lawsuits. 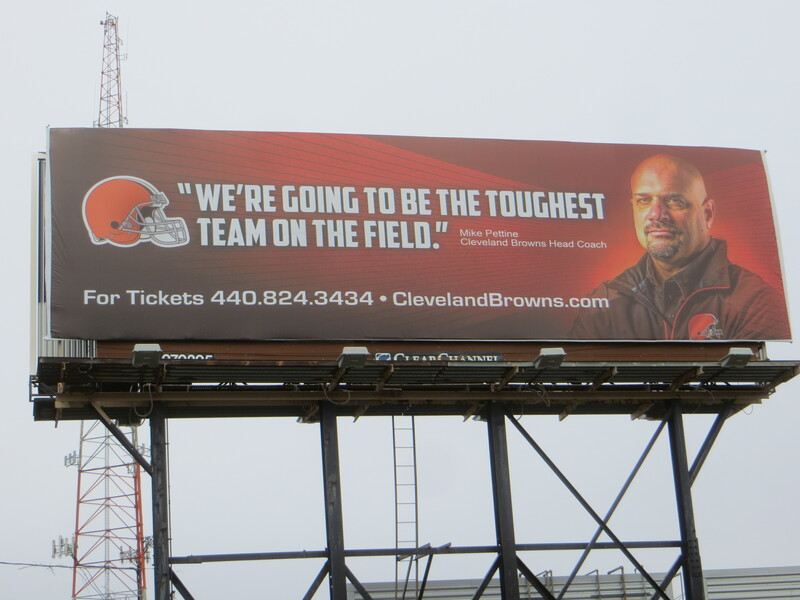 There are lots of billboards in Detroit, because there are lots of road. (It is the Motor City, after all.) And I would guess that about half of the billboards are for lawyers who are ready to help you and fight on your behalf. 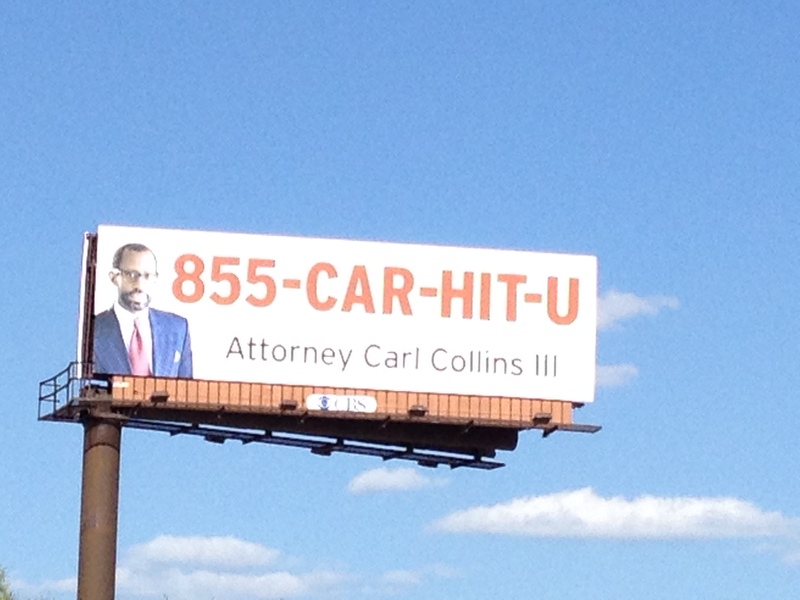 There are billboards for the auto accident attorney with a clever if not grammatically correct alphabetized phone number that an accident victim probably would remember even in an immediate, post-accident daze. There are glamorous billboards for a blonde woman attorney who goes by the initials JK and whose picture is everywhere. There are billboards for people who need legal representation for sexual harassment, billboards for people who are getting a divorce, and billboards for people who are dealing with the police. Billboards used to advertise businesses and their products; now they advertise lawyers. There’s a message in there somewhere. 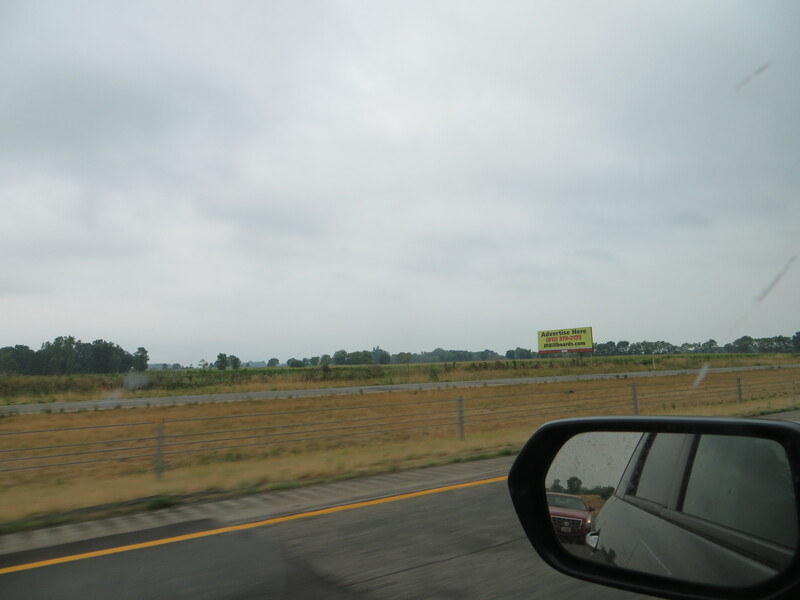 Highway billboards are the prototypical form of impulse purchase advertising. You’re traveling down the road, you see a billboard for a restaurant at the next exit, and you decide in a split-second that it’s time to pull off to get a cheeseburger. That’s why it’s jarring and unnerving to see gun sale billboards sprouting up on the stretch of I-71 between Columbus to Cincinnati. 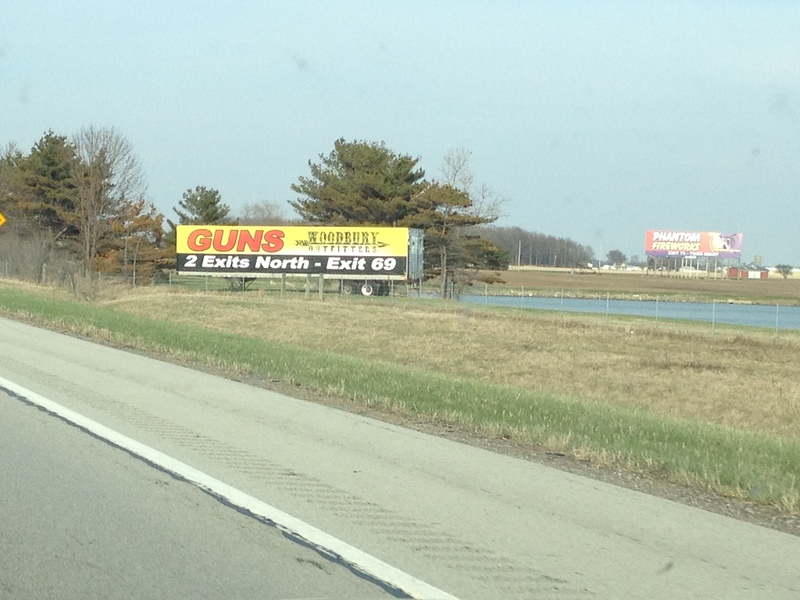 Are drivers really making spur of the moment decisions to buy firearms when they see a brightly colored “Guns” billboard? Unlike the vast majority of highway billboards, which advertise the availability of fast food, gasoline, or a place for the weary traveler to stay for the night, guns don’t seem to have any connection to the routine needs of a highway driver — unless the guns sales are motivated by the aggressive driving of their fellow motorists. If that’s the case, I need to be a lot more worried about the jerk who has been tailgating me for the last five miles. According to statistics maintained by the National Instant Criminal Background Check System, which give you a rough sense of gun ownership in American states, Ohio isn’t one of the biggest gun purchasing states in the country. In 2012, there were 45.65 NICS checks for every 1000 Ohio residents; the highest NICS check state, Kentucky, had 535.78 (!) checks for every 1000 people. Still, I’d like to think that Ohioans who are buying firearms are being thoughtful about what seems like a very significant decision, and not impulsively buying a gun because a passing billboard put the idea in their head. Driving from Columbus to Indianapolis yesterday, you could see the signs of America’s ongoing economic struggles, without having to look very hard for them. It’s a straight shot from Columbus to Indianapolis, on I-70 West. That’s one of our main east-west highways, linking cities like Columbus, Indianapolis, St. Louis, and Denver. When the economy is really cooking, the road is packed with long convoys of semi trucks that can make the drive a real pain. In America’s heartland, trucks are the true wheels of commerce. Yesterday, there was some truck traffic, but not that much — certainly not as much as in boom times. Another highway-oriented economic indicator is billboards. The number of billboards dotting the I-70 roadway reflects its status as a major transportation artery. Yesterday, many of the billboards were available for lease, which suggests that some companies may have cut back on their advertising budgets or that the businesses that formerly used the billboards have gone under. From what I saw on my road trip, I’m not surprised by the continuing bad news — like yesterday’s report of higher than expected filings of new joblessness claims.